There's no place like the Diamond Valley, and this time you can take home some incredible cash payouts. Click here to play! No room for play money here, it's real cash all the way if you want to win the massive progressive! 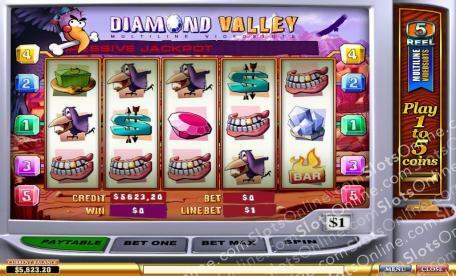 Diamond Valley is a lucrative 5-reel, 5 pay line slot, where the more lines activated allows for more winning combinations. There are no Wilds, but the Scatter symbol is the Red Gem and can appear anywhere on the reels in order to earn a payout. The Hand symbol is a Bonus, and whenever you spin up three or more on active pay lines you will be rewarded with entry into the Bonus Game, where you must rescue a helpless stranger from the pit. Take yourself down to this exciting progressive today, and walk away with a stack of Diamond Valley cash! The Red Gem is Scattered and can appear anywhere on the reels, not necessarily an active pay line, in order to earn a payout. The Hand symbol is a Bonus and whenever three or more appear on an active pay line, the Bonus Round will be triggered where you must safe someone from the pit of doom.